In a career-spanning 30 years, Kevin Maguire has made his way through an ever-changing journalistic landscape to become associate editor of the Mirror. But for one day only it was Kevin in the spotlight as he returned to his native North East to be made an Honorary Doctor of Arts at the University of Sunderland. The South Shields-born TV pundit has already forged strong links with the University as a Visiting Professor of Journalism. 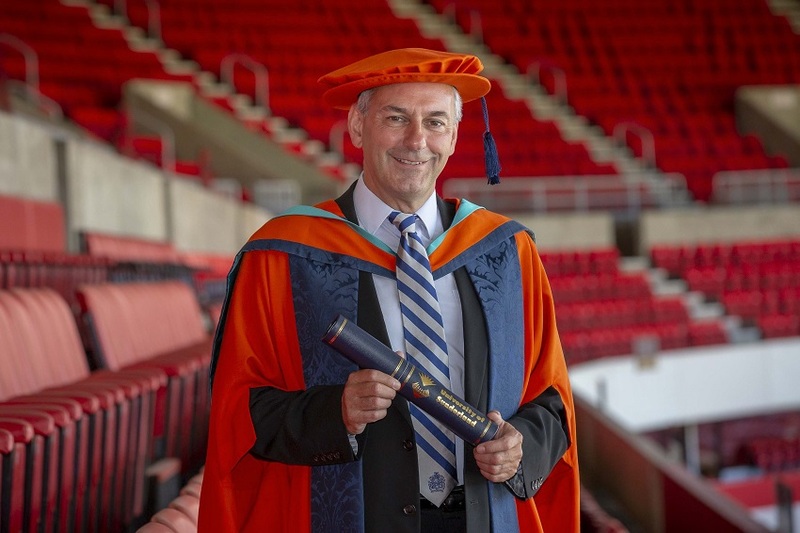 Receiving his honorary degree at the Stadium of Light on Wednesday, Kevin said: “It’s been an incredible honour to receive this accolade - and what tops it off is that it was given here at the home of Sunderland AFC. Born on September 20, 1960, Kevin was one of six children.His father, John, worked at Westoe pit, while his mother, Jennie, was a cleaner and biscuit factory worker. Family and school holidays were spent, every year, at South Shields beach where there would be the annual dip in the freezing North Sea before lunch of sandy chip butties and pop. A pupil at Harton School, Kevin had a strong North East work ethic that led to him studying politics at the University of York before a one-year journalism postgraduate diploma at Cardiff University. Currently, Kevin is associate editor of, and political columnist at, the Mirror. He previously served as chief reporter at The Guardian and was labour correspondent for The Daily Telegraph. A regular on television and radio, he also used to host his own programme on talk radio station LBC 97.3. His regular news-review slots on Good Morning Britain and Sky News sees him sparring with journo pal Andrew “Tory Boy” Pierce. Kevin’s 155,000 followers on Twitter are treated to daily rants covering everything from Brexit to Kim Jong-un, and interspersing them all is a running commentary on his beloved SAFC, of which he is a lifelong supporter. A profile once described our guest as the “mischief man of media”, so does he still see himself as that?